Mustafa Abu Hjier is 38 years old. He is the Executive director of a Youth Development center in Juhor ad Dik, a village in the central area of Gaza, near the border with Israel. He is married with two children. Beginning of 2014, he received a 2 weeks training by Médecins du Monde France (MdM), to learn how to provide basic first aid in case of emergency. 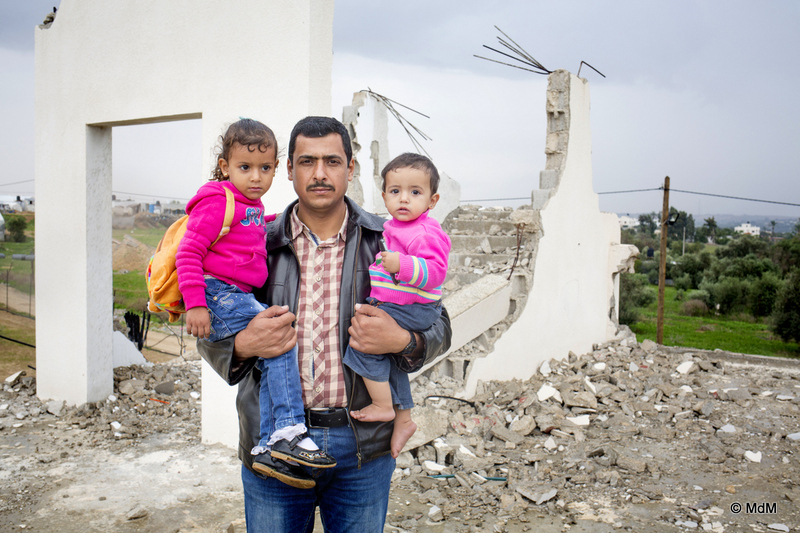 Six months later, the 2014 war started in Gaza. They were all taken to the hospital. Muna had two operations, she is now fine. If MdM first aid trainings are meant to be used in normal situations, they allowed Mustafa to know how to react when facing this critical event and to have access to an emergency kit to treat his injured neighbor. Today, Mustafa lives in a caravan. His house, all his neighborhood, were completely destroyed. The primary health care center (PHCC) were also damaged. MdM provided a mobile clinic for 4 months, other organizations later came and supported the village but the houses have still not been rebuilt. “The ambulances still take time to come here, it is useful that we know about first aid ourselves. We need this training in the border area. The situation is intense there.” concludes Mustafa. ® The 2014 war caused the death of 2 251 Palestinians, around whom 70% were civilians, 551 children. ® 11 000 Palestinians were injured, 500 000 displaced at the height of the conflict. ® Today, around 110 000 are still homeless. ® Gazan health infrastructures had to respond to this situation of crisis while they were also targeted: 17 hospitals and 58 health centers have been damaged. ® Since 2014, MdM provides first aid trainings in the border area of Gaza, an area that is intensively targeted during the wars, and faces daily risks of shooting by Israeli security forces along the border fence or at sea.